A week of canoeing along the headwaters of Virginia’s most prominent river. Traveling through the state capital of Richmond, past the cultural birthplace of America at Jamestown, and to the world’s largest naval base at Norfolk before emptying into the Chesapeake Bay, the James River is as beautiful and scenic as it is historically significant. Our Canoeing Specialty Trip journeys through the lesser-known parts of the James—its headwaters in the the Blue Ridge Mountains. Participants will float along the river and camp among the islands first mapped by George Washington in the mid-1700s. This specialty trip will give participants a full-immersion canoe-expedition experience. To that end, we have refined our program to have the perfect mix of instruction and time on the river every day, mixed in with some fun evening activities. The1-Week Canoeing Expedition focuses on paddlers with a range of experience. From kids who have never canoed to those who have floated only on still water to those who have paddled whitewater rapids, our trip caters to campers across country looking to experience canoeing in the beautiful Appalachian Mountains. 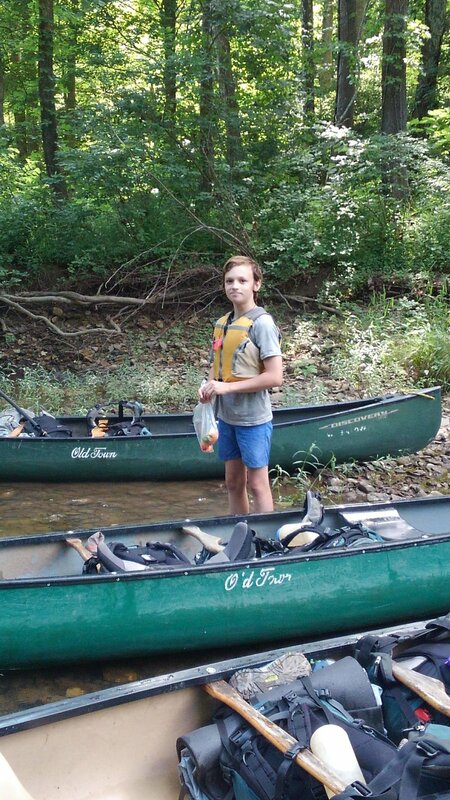 Campers learn all aspects of canoeing and have a host of new adventures while meeting new friends and paddling an amazing river in a wonderful setting. Most gear is provided for the Classic Adventure trips. We provide backpacking, camping, and canoeing gear. You need to provide clothes and hygiene items for the trips. If you have your own gear you are welcome to bring what you have. You can check out our Packing List to see what gear or clothes you might need to bring for the trip. Participant will start Base Camp, where they will go through a thorough introduction to canoeing, as well as basic outdoor and camping skills. They'll also get to know their fellow trip-mates on the teambuilding course and establish goals for their trip. After full days of glorious sends, groups will return to Base Camp where they will join the other groups in our WALYMPICS (WA's version of the Olympics with fun challenges and skills learned on trail). To celebrate the conclusion of their trip they will have an awesome spaghetti dinner and share the stories of their trip at WA's Closing Campfire. Participants will learn the types of equipment used in canoeing as well as the names of different parts of boats. They will also learn how to maintain and take care of equipment used. Participants will learn the different techniques for the different levels and type of water. For example, they will learn both draw strokes and ruddering—two different way to turn a canoe, and the situations in which each might be helpful. River reading is an extremely important skill in judging whether a river is passable and safe, as well as where to steer your boat. Participants will learn about eddys, strainers, and hydraulics, and how to catch or avoid them. Campers will camp in backpacking tents, pack all their gear in one backpack, cook backpacker style meals on back country stoves, learn Leave No Trace Principles and share the accomplishments of each day with their group and leaders around the campfire each night. Participants will leave this trip as more confident paddling and have a sense of independence and accomplishment that frequently compels them to return year after year to refine their skills and enjoy canoeing in the beautiful locations that surround us. "What a great camp. My daughter will be on her way this summer again, making this her 4th year at WAEL. Confidence, character, life building. This is NOT a cushy summer camp. Given the option to change camps every year, we get a resounding NO WAY. Gene runs an experience with fabulous staff and facilities. Thank you"